With so many design options and materials available, how do you choose the perfect baluster system for your commercial or residential staircase? Whether you are seeking a wooden baluster, rich in traditional style, or an elegant, modern metal baluster, there are many factors to consider. In this post, we will discuss the unique characteristics of both baluster systems to help you determine the perfect fit for your staircase. We often say that a staircase makes a significant first impression upon those entering a home or commercial space. One important aspect of each staircase, offering both safety and style, is the baluster system. Both wooden and metal balusters are popular options, and each offers distinct features. Versatile metal complements every style, from curved, straight, L-shape and U-shape staircases. Also versatile, wood serves as the classic option, bringing in southern charm as seen in our recently featured sorority homes blog series. Metal balusters are indeed a popular trend, but let us not forget about wood and the pure elegance it can bring to a staircase. From colonial to Craftsman staircases, wooden balusters offer a wide array of options. Like metal, they are a great fit for stairs of all styles, both curved and straight. As you can see, both wooden and metal balusters offer great style and versatility. For additional inspiration, check out our product brochure for a catalog of wood and metal baluster options. Our experienced team is available to guide you through the decision-making process, working with you to design, build and install the perfect staircase and handrail system to fit your vision. Visit our wooden and metal baluster system project galleries for additional details and pictures from our exquisite projects. 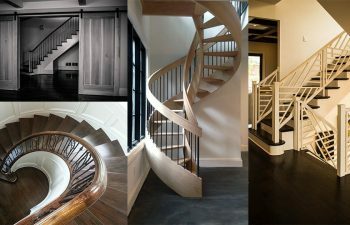 From inspiration to installation our team is committed to designing and building the highest quality custom staircases. Our reputation speaks for itself and client satisfaction is our highest priority. Contact us today to discuss your next staircase project.